"I hate Glocks." That was my standard reply for the first couple of years after Glocks were introduced into this country a few years back. It was 1986, the 1911 style .45 auto was the defensive pistol to have if the proverbial fertilizer hit the fan. Then some guy in Austria comes up with this plastic-framed pistol in the weak little nine millimeter caliber. He then had the nerve to bring the plastic gun over here and expect Americans to buy the thing. Sure, it held lots of little-bitty bullets, and was relatively light in weight, and was accurate enough for it's intended purpose, but a PLASTIC gun? No way. It just won't sell in the good ol' USA. After only about 1.5 million were sold here and just about every law enforcement agency in the country either issued or approved the Glock for duty, I decided that perhaps I should check into the idea that the gun just might work after all. I had handled a couple of Glocks and read a lot about them. I had heard all the remarks about them melting in a hot car and being referred to as "Combat Tupperware." I knew people that shot and liked the Glock, but I was very happy with my Colt .45 auto. The Colt shot very well, was made of real steel, and had a bigger hole in the barrel. But there are times that the old Colt gets pretty heavy on the belt and hard to conceal unless carried in an inside-the-pants holster. My pants are plenty tight without the benefit of 40 ounces of steel inserted between my jeans and me. I started looking for a lighter, handier gun that could be carried with a minimum of bulk. My search had me looking closer at the Glock. I happened upon a pretty good deal on a Glock 19 with three fifteen-round pre-ban magazines. I took the deal with the idea that if I didn't like it, I knew that I could make a hundred bucks by selling it to some poor guy who didn't mind carrying a plastic gun. I shot it and liked it. I didn't want to carry it on the belt, but still wanted to be able to conceal it when necessary. 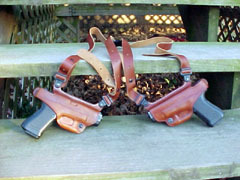 I sent off for a Galco Miami Classic shoulder holster with a double magazine pouch. It proved to be a comfortable, reliable rig. 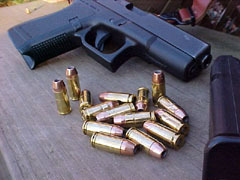 The gun shoots every brand of 9mm ammo that I have tried in it, along with a couple of different handloads that I had worked up for another gun. The frame and slide are smooth and rounded, like a used bar of soap, and don't have any sharp corners to hang on clothing or slow the draw. I added a good set of tritium night sights for low-light shooting. It had a good balance of weight, firepower, concealability, and shootability. It was a good defense rig. Then I happened upon another model 19 that was already fitted with the tritium sights at a good price. Another 70 bucks to Galco got me a holster to go under the other arm. The result is the rig pictured here. 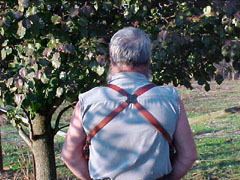 Two Glock 19s in a double shoulder holster. This gives me a total of 32 rounds of 9mm hollowpoint ammo. 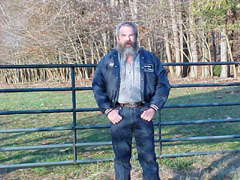 In the case of a jam or a damaged or dropped gun, I have an identical weapon under the other arm, waiting and ready. I also have, in the rare event that 16 rounds is not enough, the quickest reload possible by just pulling the second gun. An added benefit is the option to hand a weapon to a qualified friend if his help is needed and he wasn't packing at the time. The Glock has proven to be a reliable, accurate weapon and has enjoyed phenomenal success in recent years. It doesn't, at least for me, stir the soul like blued steel and walnut. It doesn't give me the same feeling I get when thumbing back the hammer on an old Flat Top Ruger, or even a new Vaquero. But, for going heeled in strange places filled with stranger people, it is very comforting to have a Glock under each arm. I don't hate Glocks anymore. 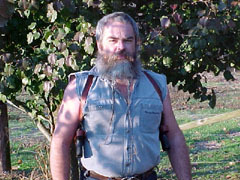 Does the author look like he's carrying 32 rounds of 9mm firepower? Double Galco Miami Classic - quality leather carrying quality self-defense tools you can bet your life on! 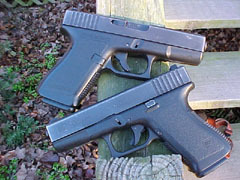 2 Glocks provide maximum firepower in a lightweight, balanced package. They may not be pretty, but they WORK!